KJIPUKTUK (Halifax) – Can we just race down the highway? Rob a bank? Steal from a store? Of course not. How then can the government pass legislation that is against our Canadian Charter of Rights and Freedoms? 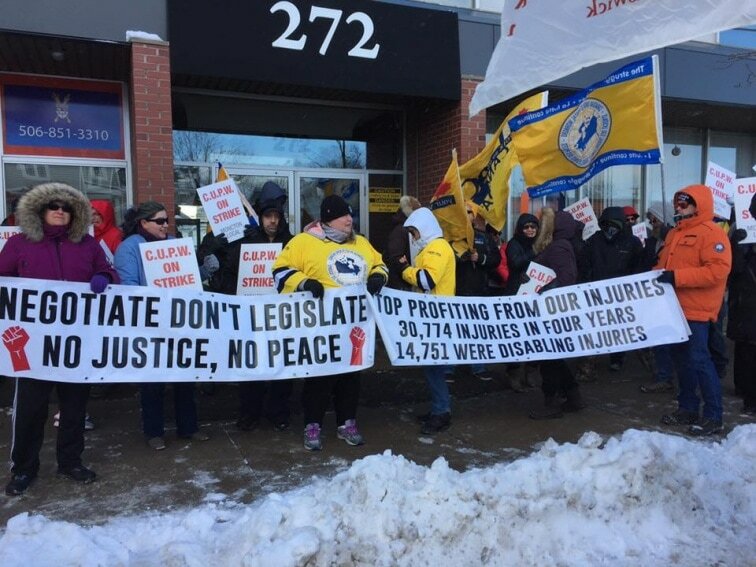 The back-to-work legislation passed in the Senate this past Tuesday will send members of the Canadian Union of Postal Workers (CUPW) back to the same old unresolved problems in the workplace at the busiest time of the year. As more right-wing governments get elected, we are seeing those governments trampling on workers’ rights with no regard for the law of the land. No one other than our unions are working to hold them accountable for these shameful acts. Let’s flip the coin and look at the wealthy corporate elite who get away with many things without sanctions by governments. Workers in our country die on the job every day. One would think that our government would make laws to stop such tragedies. The reality is that since the Westray Bill was passed, less than a dozen charges have been laid across the country for workplace deaths. Unions fought long and hard to get the Westray Bill enacted, and now the government does little to ensure it is enforced when a worker dies in a workplace accident. Killing workers is not okay and we need laws to be enforced and not have elected leaders turn a blind eye to these thousands of tragedies. Imagine a corporation in the oil sector that has a massive oil spill. Does the government hold them to account for the mess they caused? One would think that of course, the government would impose legislation on them for that environmental disaster. Well, sadly, far too often government, and the taxpayers, step in and pay for the clean-up. Corporations get away pretty much unscathed from many environmental disasters. Imagine if thousands of Canadian just stopped paying their taxes? I am confident that all those individuals would be held accountable. The reality is that thousands of corporations and their CEOs are tax-dodging and avoid paying their taxes and hide their wealth in tax havens. It seems we have a government that doesn’t hold them accountable for these actions. Why not write a law to ensure this doesn’t happen? It’s a big problem as the rich siphon billions of dollars offshore, tax money we can use. Government is aware of this tax avoidance and does little to correct it. A corporation like Sears was shut down and thousands of its workers were thrown to the streets through no fault of their own and this corporation used the law to take away those workers’ pensions and severance pay. A corporation like Sears paid its CEO and other board members millions to shut it down while thousands of workers get basically nothing. We are sure our government would write laws to protect workers severance and pensions who spent a lifetime working at these companies. We know this has happened far too often in the past and governments have done very little to protect workers. Our governments have come to the rescue of corporations time and time again at a massive cost to taxpayers, our workers and our environment and created this economic mess. Tax breaks, handouts and tax sheltering are rampant, and there is a total lack of courage and political will to impose laws on corporations and their CEOs. Can you see the pattern here in how our governments react when it comes to workers and the corporate elite in their ivory towers? My point is that governments need to stand up, make and enforce laws for corporations as quickly as they do for unions. Government must ensure everyone pays their fair share of taxes, to improve worker health and safety, to ensure every worker comes home at the end of his or her shift. They must make sure women are treated fairly and paid the same as the men they work beside. These are the things that our postal workers are fighting for. What is absurd is what the wealthy and corporate elite are getting away with in Canada, to the detriment of the rest of us. The federal liberals are no different from any other federal government we have seen in our lifetime. They are quick to impose laws such as back-to-work legislation. This week’s legislation will likely be found unconstitutional under our Canadian Charter of Rights and Freedoms. No government should be able to write a bill that restricts workers’ rights to freedom of association and freedom of expression. An Ontario superior court ruled in favour of the postal workers in 2016 and we presume a court challenge today would reach the same conclusion. Makes me wonder – is it okay to break laws? It seems to be okay for the government to do it.